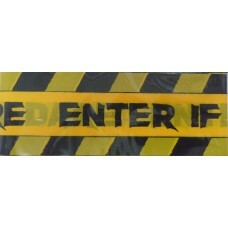 If you are searching for halloween props for your next themed party then take a look at this haunted house warning tape. Perfect for decorating your halloween or horror party this non-adhesive yellow and black "Enter If you Dare" fright tape measures 6.5cm wide by 9.1m in length. Printed on one side only, this tape repeats the pattern in one continuous length. Makes the perfect party prop.